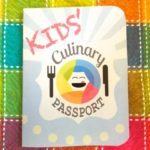 Kids’ Culinary Passport – Cook and craft around the world! 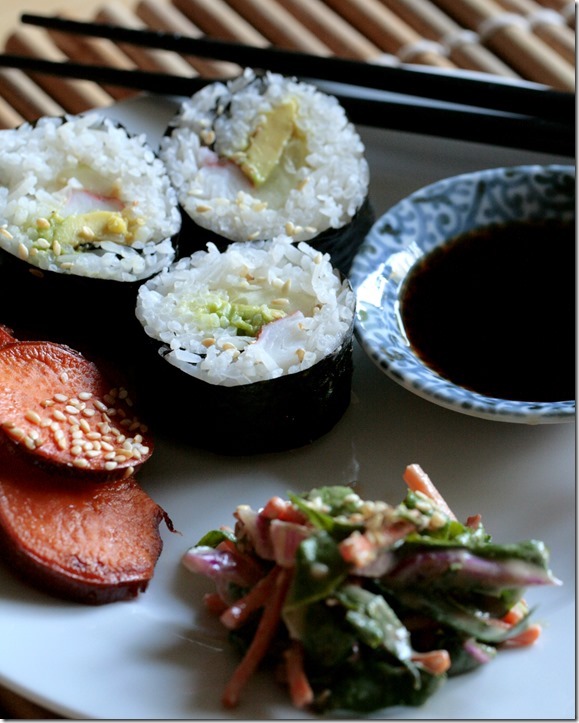 Japan is your next stop on your Kids’ Culinary Passport here at Inner Child Food! My children and I enjoy just about everything from Japan. We love the food, the culture, and the crafts! Most people know that rice is very popular in Japan. In fact, rice is so important that the word for ‘cooked rice’ (gohan) is the same word that is used for ‘meal’! There are many other common dishes that do not include rice, although most are accompanied by a bowl of rice or two. The dish we made here, Daigaku Imo, is very popular with Japanese collage kids. 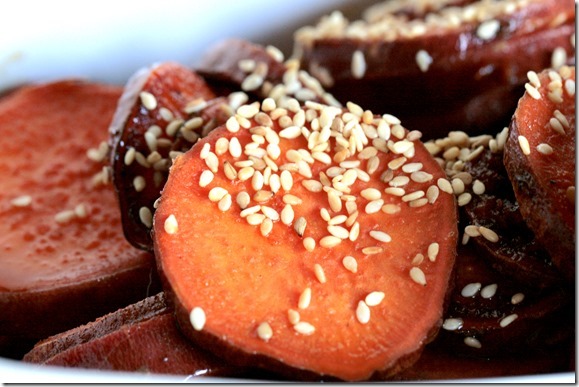 It is a candied sweet potato dish that is easy to make and tastes good cold. Perfect to take in a bento (lunch box) to classes with you! 1. Slice the sweet potatoes thin and place in a bowl of water with a squirt of lemon juice and a pinch of salt. This keeps the sweet potatoes from sticking to the pan during cooking. 2. In a large skillet, heat the oil until a drop of water ‘dances’ on the oil. Add the sweet potatoes in a single layer and turn when edges get golden brown. Drain on paper towels or rack. 3. Mix the sugar, soy sauce, and water in a small sauce pan until hot and begins to thicken. Add in the sweet potatoes and stir until coated. 4. Sprinkle with gomasio or sesame seeds and enjoy hot or cold! 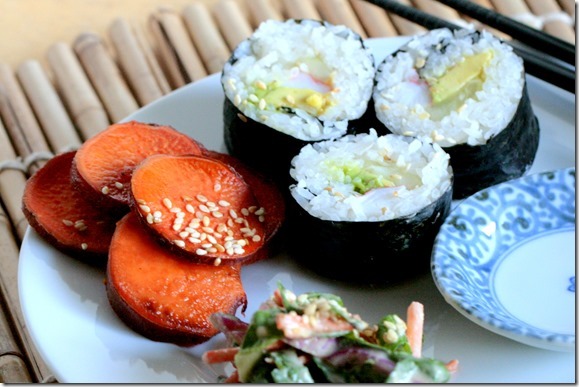 We made these yummy sweet potatoes to go along with garden salad with a sesame dressing and (my kids favorite) California rolls! Japan, we get to put a stamp on you in our culinary passport! This post is part of our Kids’ Culinary Passport series, designed for parents and kids to cook and craft their way around the world together! Every week this month, we’ll feature a new country with a recipe and quick craft project. It’s FREE, fun, and educational. Share photos of your kids’ creations on Instagram using hashtag #KidsCulinaryPassport, or on our Inner Child Food Facebook Page. Join us, and get your free printable passport with stamps here! 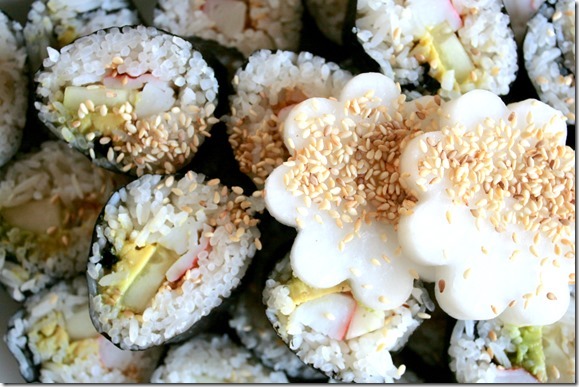 Did you make your own California Rolls or did you buy them already made? If you made them can you share how you did it?